1 Nazi 1: Ah, there you are Herr Kolonel Haken. We were wondering where you had gotten to. 2 Nazi 1: Die crew has captured and secured enough dinosaurs for die Führer's plans. We can leave for Berlin at your command! 3 Haken: You mean to tell me you were here catching dinosaurs die whole time? 4 Nazi 1: Ja, of course. Did you think we were here to sit around in die zeppelin while you did it, Herr Kolonel? It's a bit hard to see, but the dinosaur in the cage being lifted into the zeppelin (floating above the scene) is a Tyrannosaurus, the one behind Erwin is a Triceratops, the one in the other cage is a Stegosaurus, and there's a Pteranodon (which isn't technically a dinosaur) chained on to the ground. Sometimes, like in today's strip, there's just a lot of detail that is lost when I shrink the pictures down to fit in the strip. In all, they're shrunk to 8% of the original size that comes out of my camera. To give you an idea of the details visible in the full image, here's panel 3, shrunk to only a quarter of its original size. You can also see how merciless the depth of field is shooting this close to a subject - thankfully that's masked a lot when I shrink the images further. 2013-06-06 Rerun commentary: Wow, cool! 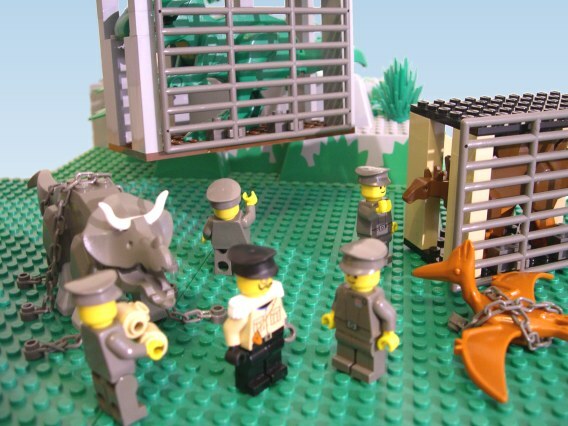 I'd forgotten just how awesome it is to make scenes like this using LEGO figures and dinosaurs. That large image also shows the problem with shooting with a limited number of baseplates and replacing the background with a sky colour. It sort of implies they're on the edge of a cliff. Although given they're on a tepui in Venezuela, that's actually not a bad assumption. Last Modified: Thursday, 6 June 2013; 03:11:01 PST.